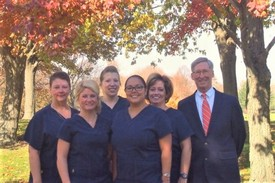 Meet the well-rounded team at Dr. Haussermann's office! Kathy and Kari are our two licensed hygienists. Both graduated from the Parkland College Hygiene program and are experienced hygienists who enjoy being here and helping our patients have the best possible oral health. Mandy, Rachel and Sandy are a trifecta assisting team. The three tag team the tasks of scheduling, helping you with treatment plans or payment plans, submitting insurance pre-estimates and claims, and assisting Dr. Haussermann. Kathy and Mandy have been a part of Dr. Haussermann's committed team, respectively, for thirty-two and sixteen years! The "newer" team members include Rachel here for six years and Sandy and Kari, each here for three. We all look forward to many more days at Dr. Haussermann's office with you! Our professional and educated team loves dentistry and seeing both lifelong and new patients. We recognize that our patients are unique individuals who have placed a great deal of trust in us. That is just one reason why we value each and every patient relationship! Thank you so much for taking the time to visit this site and find out more about this dental practice, our team, and the services we can provide to help you achieve optimum oral health.